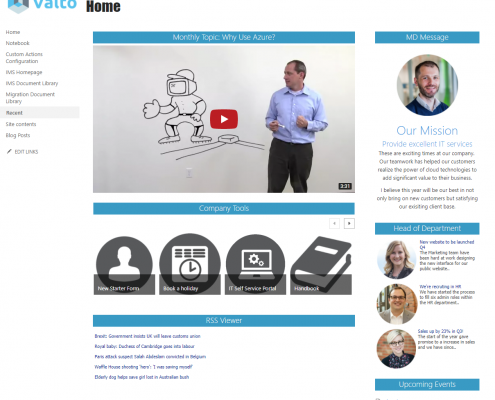 A fully integrated Office365 & SharePoint Intranet. We help companies understand the capabilities of SharePoint and align their organisational requirements and help build a specification / design for the project. All of our SharePoint Experts are based in the UK and have extensive experience in deploying SharePoint Intranet solutions. 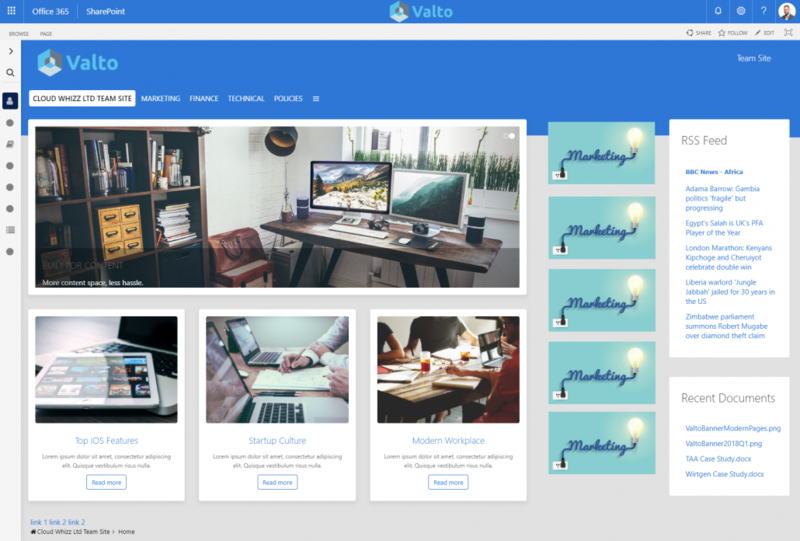 Once deployed Valto can support and manage the SharePoint environment and provide hosting. 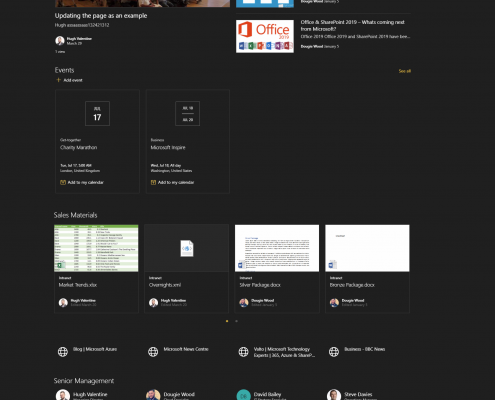 A SharePoint intranet helps teams to communicate better, collaborate more effectively and achieve more. Whether you already use a SharePoint Intranet, and want to evolve it to meet your changing needs, or are starting an entirely new project and, we can help. Talk to a member of our consultancy team today to start the process of planning an intranet solution that will help your team work together smarter. 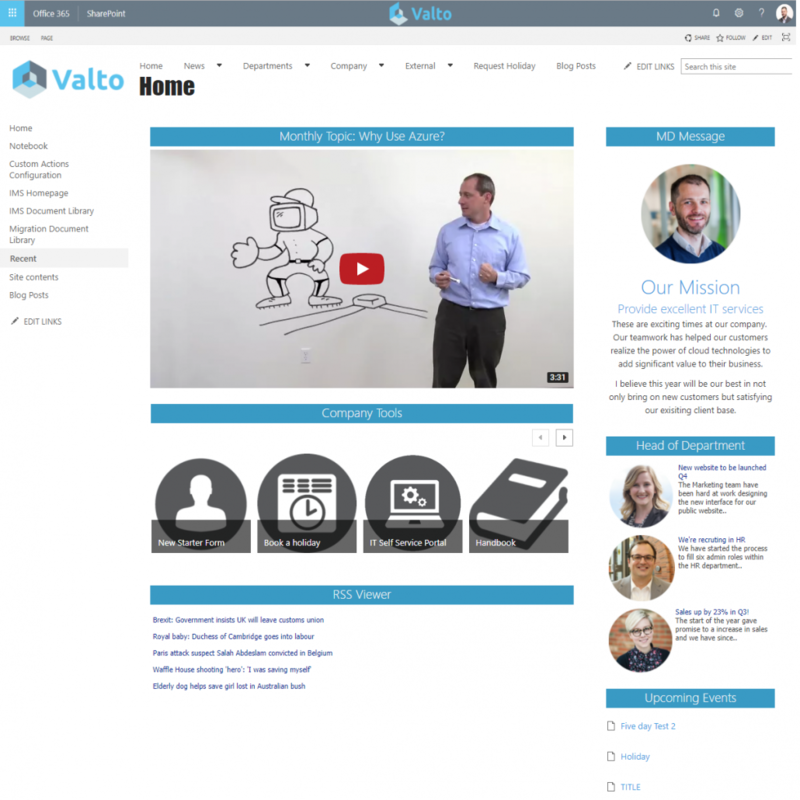 Find out how Valto can help you with SharePoint Intranet. Call now on 03335 779 009. 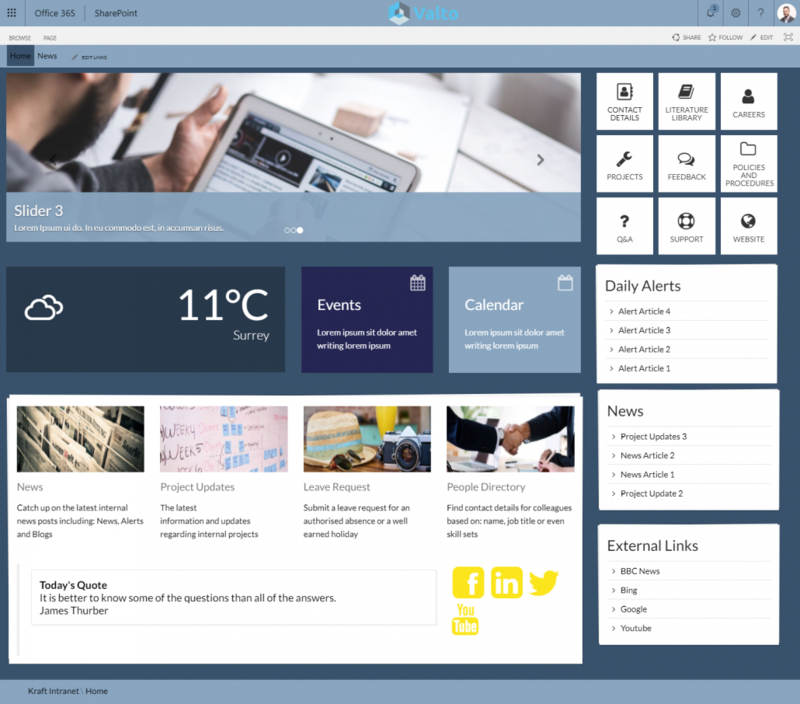 A well designed SharePoint Intranet allows you to share information across applications to improve communications. 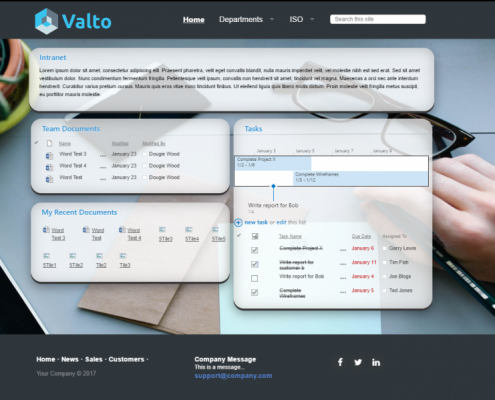 At Valto, our experienced Microsoft Certified team can assist you in integrating data from all of your applications into SharePoint to make sharing information seamless. This will help improve productivity and efficiency as staff will have access to all the information that they need to work effectively. Integrate Skype for Business into SharePoint to enable smoother communication for staff across multiple locations. Move data effortlessly between applications using OneDrive and enable better collaboration in the cloud. Host SharePoint in a fully managed cloud environment using Microsoft Azure to improve resilience and flexibility. Integrate application data and content from Office 365 with SharePoint or SharePoint Online as your collaboration platform. 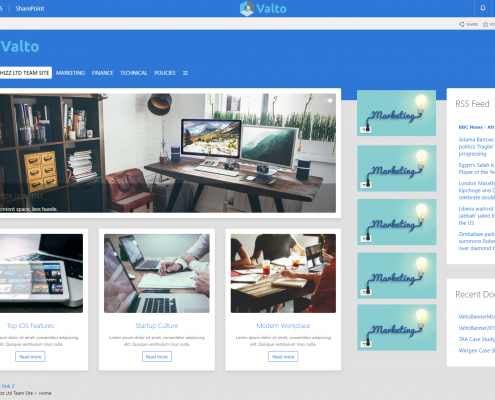 Valto help you through the whole process of developing an Intranet including choosing the best platform for your needs. Whether you want the flexibility of SharePoint 2016 with bespoke development of workflows and branding, or a more straightforward solution that built using SharePoint Online and Office 365 we can help. Our solutions can be deployed with full branding to match your corporate identity, and we can also provide full SharePoint training on the application which will support adoption. We’ll work with you to ensure that your new intranet fits in with the long term goals of your business’ IT Strategy. 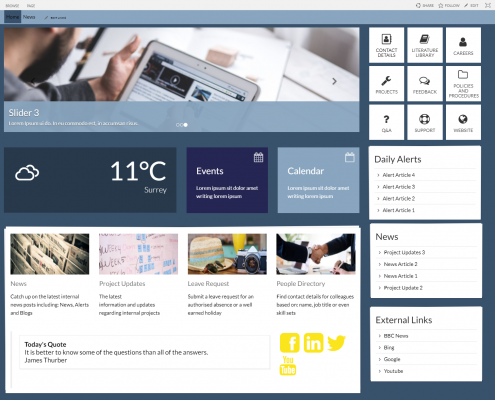 A key aspect of our SharePoint Intranet development service is helping your organisation make the most of the platform. You’ll benefit from clear, concise documentation for your internal IT team along with access to our world class support service. 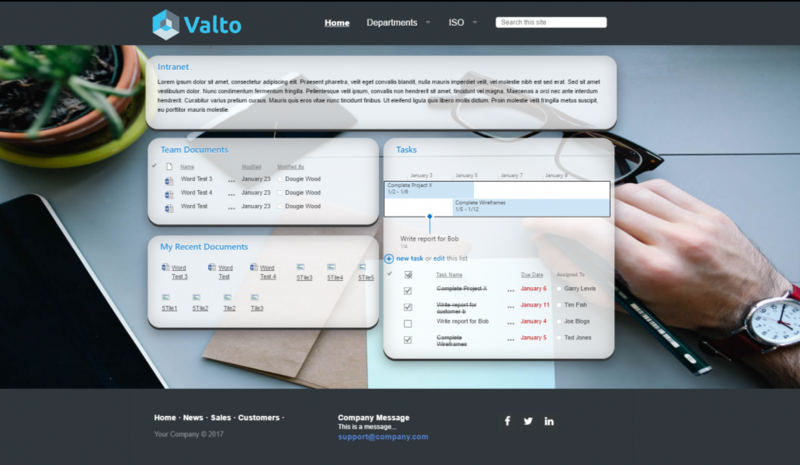 Ready to find out more about how Valto can help you transform internal communication? Contact us today.